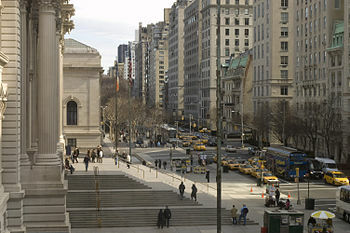 Fifth Avenue er tann størsta handilsgøtan í býnum New York í USA og verður hildin at vera ein av heimsins bestu og dýrastu handilsgøtum. 5th Avenue er ein sera long handilsgøta á Manhattan. Fifth Avenue liggur sera væl fyri, mitt í New York City, beint við Times Square, tætt við bæði Central Park og eisini tey kendu listasøvnini Metropolitan Museum of Art og Solomon R. Guggenheim Museum. Eisini eru ein hópur av matstovum har um vegir. ↑ Google (September 12, 2015). "Fifth Avenue (south of 120th Street)". Google Maps. Google. Retrieved September 12, 2015. ↑ Google (September 12, 2015). "Fifth Avenue (north of 124th Street)". Google Maps. Google. Retrieved September 12, 2015. ↑ "Fifth Avenue The World's Most Expensive Shopping Street (PHOTOS) (Subtext: "For the 9th year in a row, Fifth Avenue between 39th and 60th Streets ranks first among Cushman & Wakefield's Main Streets Across the World Report, according to the New York Post.")". HuffingtonPost.com, Inc. September 21, 2010. http://www.huffingtonpost.com/2010/09/21/the-worlds-most-expensive_1_n_733301.html. Heintað October 23, 2010. ↑ Foderaro, Lisa W. "Survey Reaffirms 5th Ave. at Top of the Retail Rent Heap", The New York Times, April 29, 1997. Retrieved February 5, 2008. Hendan síðan var seinast broytt 02:06, 31. mar 2017.